Whether you are an experienced boxer or just looking to add something new to your workout regimen, the adult boxing workouts at Ballard Fitness can help you get the physical results you are looking to achieve, set you towards maintaining a healthier lifestyle, and give you the support to tackle anything that life throws your way. At Ballard Fitness, Gary Ballard is devoted to providing his clients with expert individual One-On-One Training Sessions. He brings the dedication and power that he put forward in his own boxing career into each of his individual training sessions. "Such a great workout. You will burn a tons of calories along with building lean muscle. I met Gary about 11 years old when I was 14 years old. I was about four foot - eleven inches (under five feet) and I weighed 155 lbs so I was very over weight. I worked out with Gary for two years and reduced my weight to about 95 lbs (but remember I was only 4'11 or two years later probably 5'2). I was in the best shape (great core strength) I ended up wrestling in high school. Gary's workouts are great for any age from beginner to expert. I highly recommend anyone to try out a session!!!" "Most amazing workout with the most amazing trainer! Thanks Gary!" "BEST WORKOUT EVER!!! I highly recommend you come and train with Gary, he is the best and really knows what he is doing! I REALLY enjoy his classes!" "Such a fun, badass, full body workout. HIGHLY recommend it." "BEST WORK OUT EVER!Â GARY GAVE ME A SIX PACK AT 39 ! ;-)"
"Fun and intense workout. Even for beginners like me. I would highly recommend this class!" "Fun class and Gary is a great teacher. You will burn a ton of calories and enjoy it!" "This is the best workout ever. 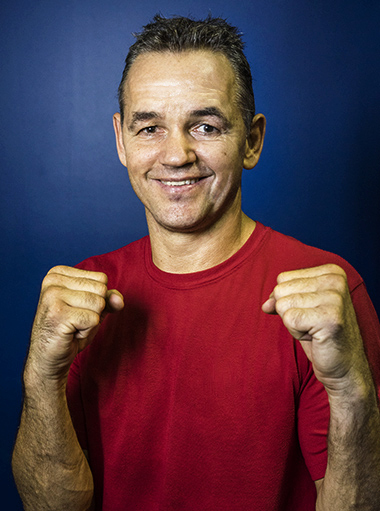 Gary is amazing with beginners as well as seasoned boxers. My entire body gets worked out. LOVE IT. I love the NEW location that has any fitness need available too. No MEMBERSHIP FEES FOR BOXING CLASSES .... woohoo"
Group boxing classes at Ballard Fitness will give you a full-body workout that is guaranteed to deliver results. You’ll increase cardiovascular endurance, tone muscles, and have fun while doing it. Gary is ready, are you?